The largest island in the world seems often overlooked. 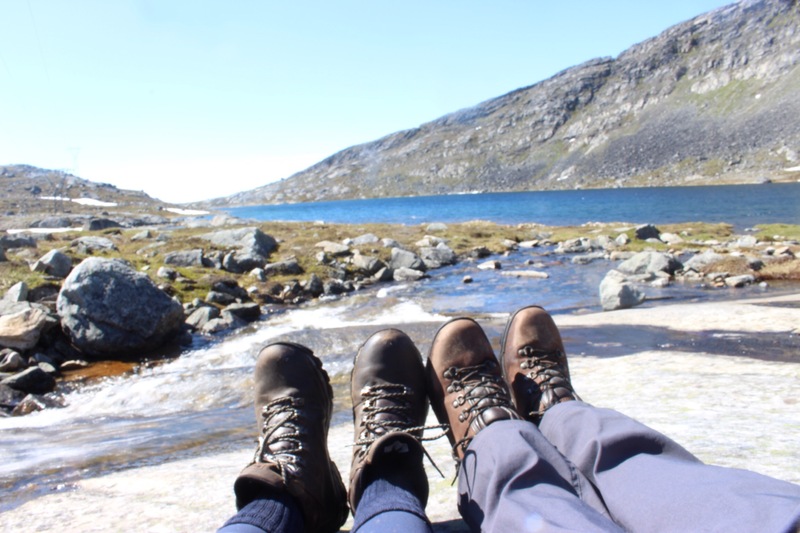 Sat at the top of the globe in an area away from the spotlight Greenland benefits from not being invaded by too much western influence. 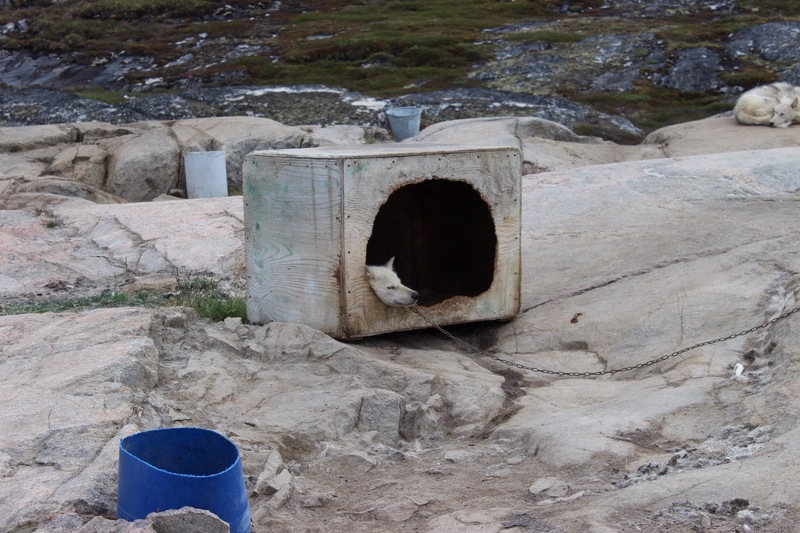 The Inuit people go about their lives in touch with modern living but keeping hold of their traditions and practices. 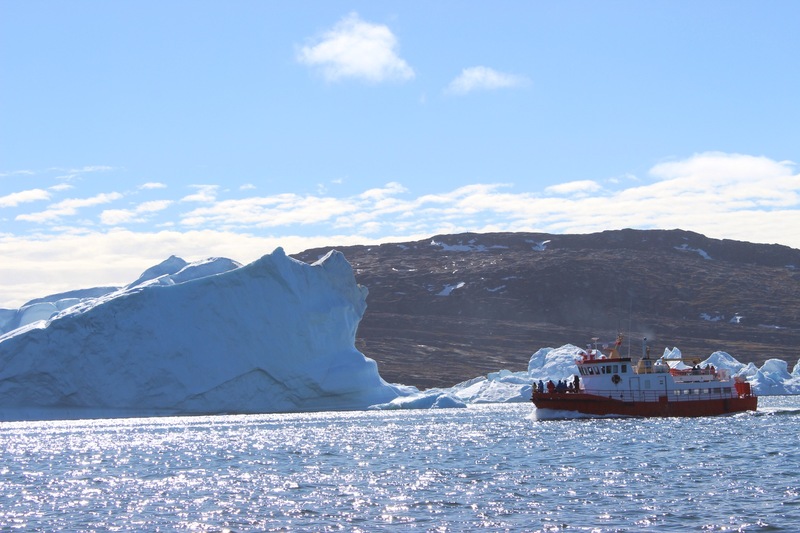 We were immensely privileged to see glaciers and icebergs, enjoy the clear clean air that almost sparkled with freshness. 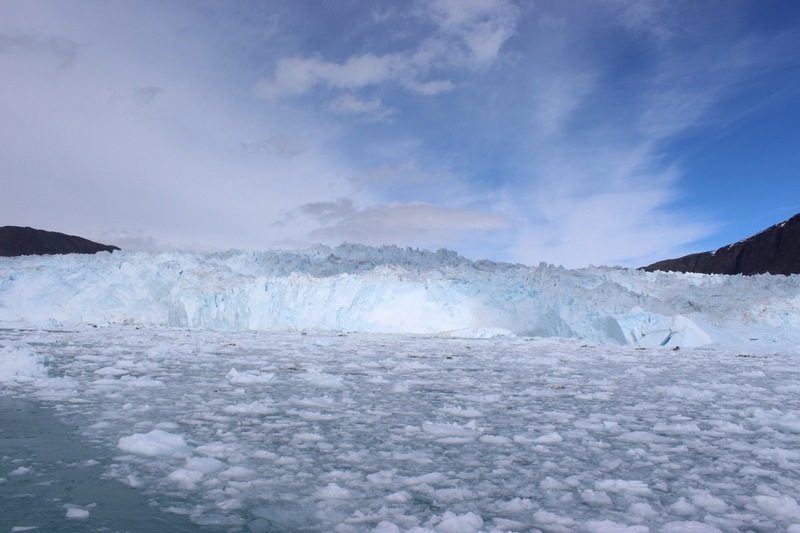 The highlight for me was witnessing a glacier calving. 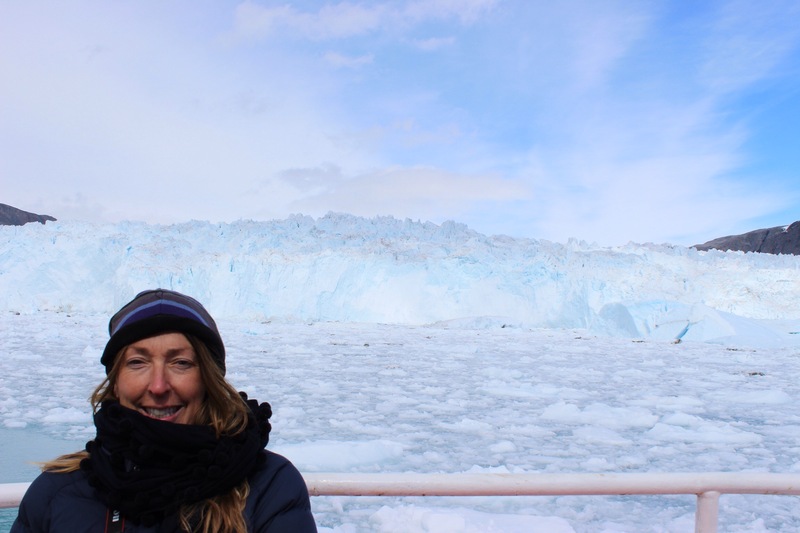 The imposing 3 kilometre long 200m high wall of ice was a beautiful pristine backdrop to the blues green hue of the ice filled sea in front of it. We bobbed around in the boat watching and waiting, not daring to take our eyes of the spectacle in case we missed a calving. Sure enough we were rewarded with a piece breaking off and sending a swell to rock our boat a kilometre away. This reminded us that the beauty we enjoyed is disappearing. The retreat of the ice is increasing in speed and the environment will change permanently. 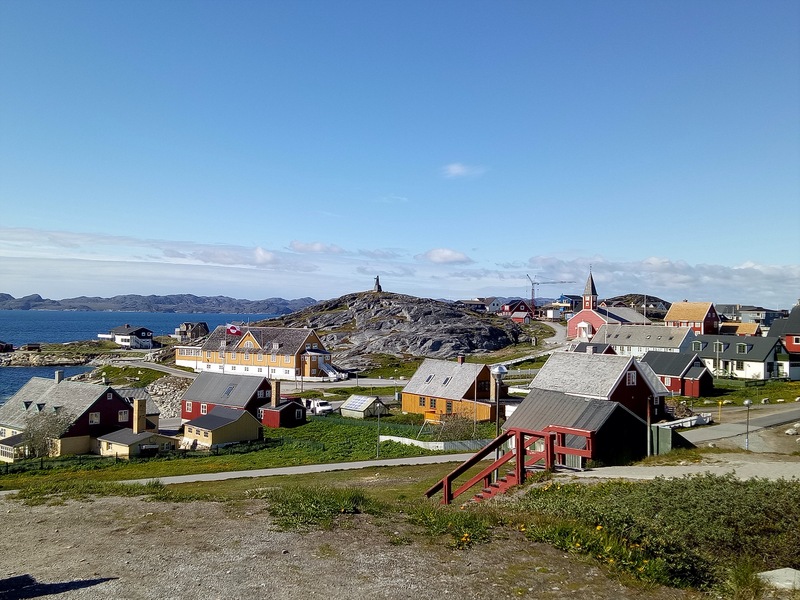 The town of Ilulissat is full of Greenlandic charm with brightly coloured houses dotting the shoreline and husky dogs sleeping in the sunshine. The smell of fish pervaded the coastline but, wasn’t unpleasant. We experienced sun, mist, rain and snow during our short stay. The temperatures didn’t feel as cold as they might due to the largely dry atmosphere although it was still pretty chilly at times. 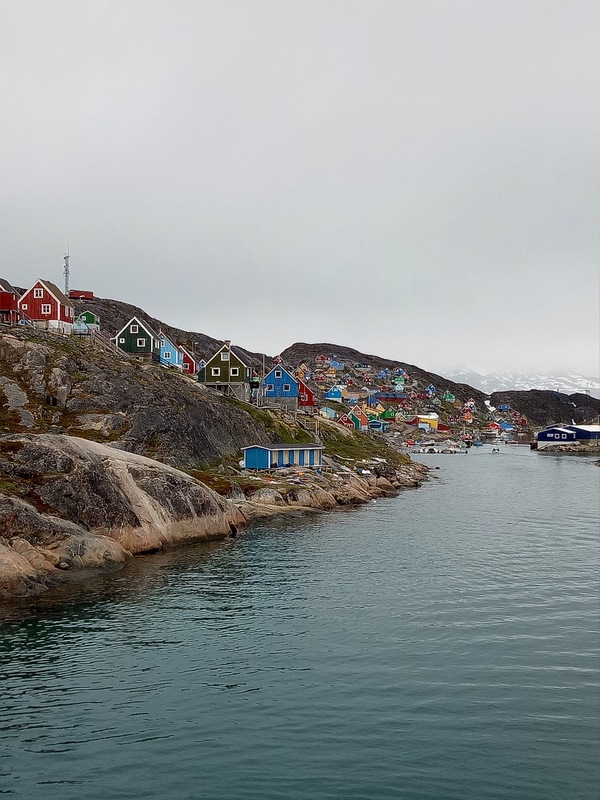 During our stay in Greenland we travelled the way most locals do using the coastal ferry. There are no roads between settlements. The ferry is expensive but provides an efficient and pleasurable way to travel. We saw whales on a number of occasions during the day and two nights that we spent on the ferry. The thrill of seeing these magnificent creatures breach and dive is wonderful. 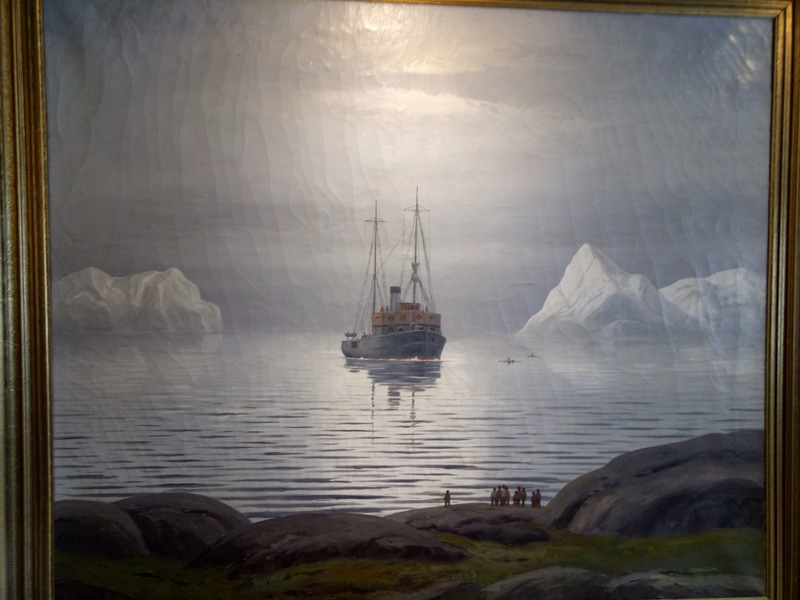 Having stopped at a couple of smallish towns as we sailed south we settled into a routine on board chatting to locals and enjoying the constant views of beautiful ocean and icebergs, always ready to run up on deck at the announcement of a whale sighting. 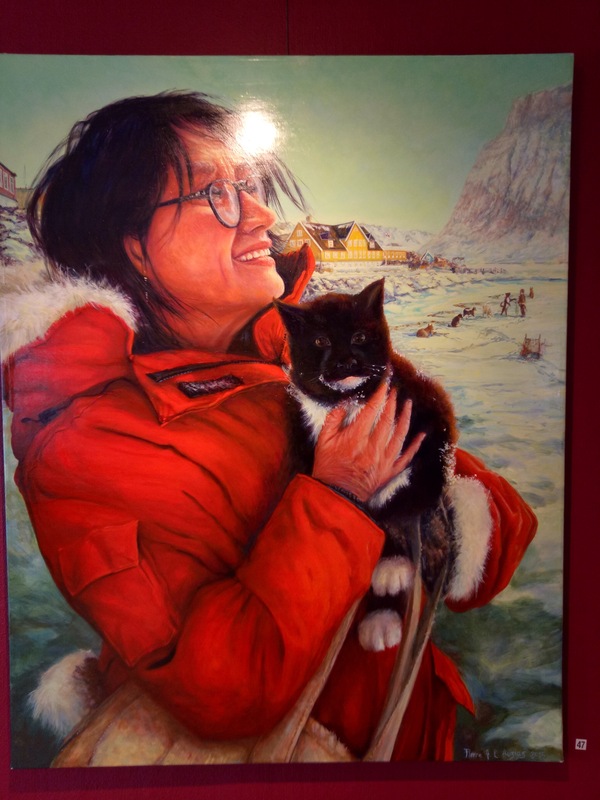 While chatting with one young mum who was taking her 7 year old down to the capital Nuuk, we were enlightened by her and highly amused as she stated “I’m not into nature and I don’t like the cold”. She went on, “I like staying in and watching tv”. 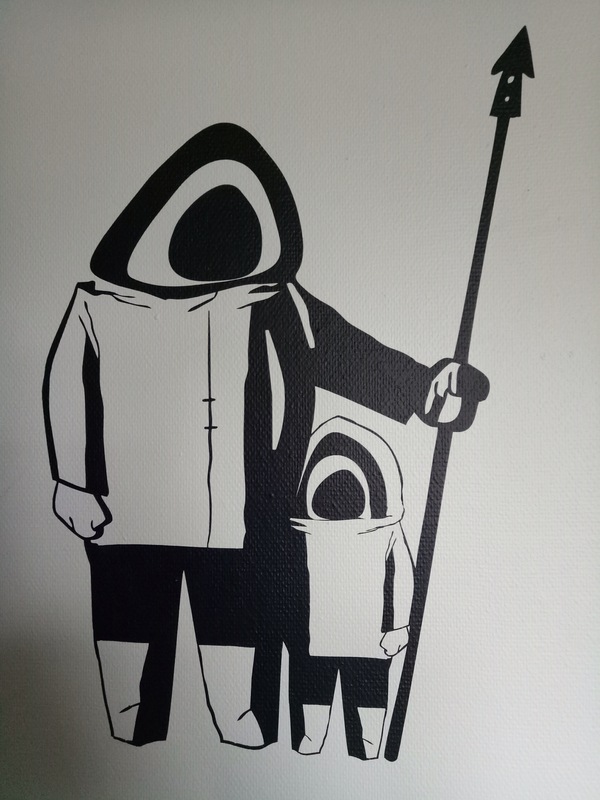 Well that shattered our illusion that the Greenlanders were outdoorsy nature lovers who thrived in the icey climate and all fished as a pastime. Nuuk greeted us with freezing cold rain and we trudged to our hostel arriving at 8am, way too early to check in. We sheltered in a neighbouring hostel for a few hours until we could get into ours. 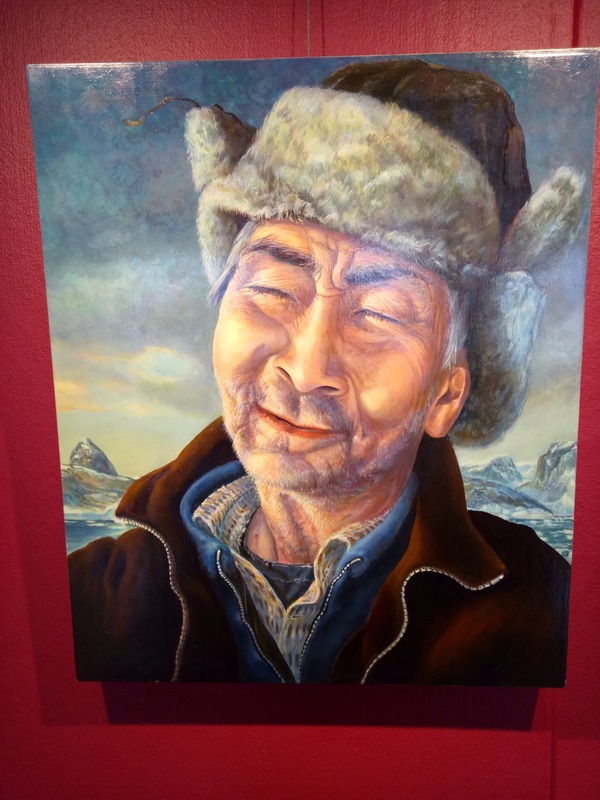 The weather didn’t improve so we spent an interesting few hours in Greenland’s wonderful National Museum and browsing the few craft shops along the waterfront. The shops don’t have big windows with enticing displays. Most are like small houses with small windows and a solid front door. We tentatively entered the first, hoping it was a shop and not someones private house. Sure enough once in the shelves and counters displayed all kinds of crafts, seal skin products, snow boots, woollen clothing and locally made jewellery. Sadly all too expensive for our budget but, still nice to look at. We were wet through and decided we had earned our first meal of our trip out in a restaurant. We enjoyed warming up over steaming lattes followed by chocolate truffles. It was sad to wave farewell to Greenland. I wonder if I’ll ever return. I really hope I can one day. We took off from the short runway on a 30 seater prop plane for the three and half hour flight down to Reykjavik. The sun was at it best as we climbed and we could see the vast ice cap that cover most of this vast land. I would have been more sad to leave had I not been heading off with Lauren to her new ‘home’ for the next 2 months, Iceland. We landed in Reykjavik to be greeted yet again by rain. We put up Lauren’s tent (the smallest tent in the world) and laughed at the prospect of us both managing to fit in it with our rucksacks. After a surprisingly good nights rest we awoke to start the next stage of our trip, exploring Reykjavik and it’s surroundings. It was an immensely special trip to have with you Lauren. Thank you for planning it and inviting me to join you. I think both you and I will treasure the time together and the experience we shared of travelling to the top of the world. Just so that you know, now that I’ve got my breath back, I’m ready and waiting for mother-daughter trip number 5! !